Spoiled by a long summer, most people living in the northern hemisphere now have to deal with lower temperatures, and in some cases even snow. This sets the scenery for the upcoming holidays, and with that also for these watches, which go very well with a bit of winter wonderland! White as snow, that is the Speedmaster that Omega build in reference to the heavenly body that stands closest to the earth. The case is made out of white ceramic, and even the dial is crafted from this material. With a diameter of 44.25mm is it an imposing watch. Also, the back is beautiful because it is there that we can admire automatic chronograph caliber 9300 in all its glory, and with its stunning finish! When Hublot makes a limited edition, they always go all in! The Big Bang Alps is no exception and comes with a removable cuff bracelet in which shearling wool is used. This offers a pleasant contrast to the case, which is crafted from frosted carbon. 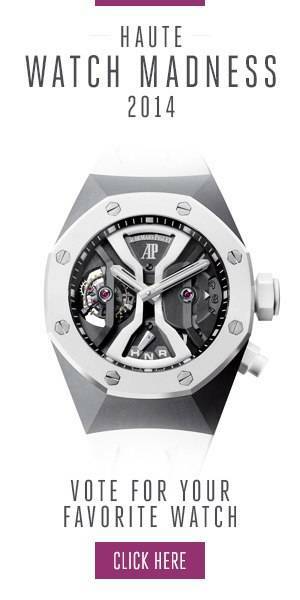 It is fitted with caliber HUB1242, which Hublot makes in-house and which can not only be admired from the front thanks to the skeletonized dial, but also through the glass case back! Pure as snow, that is the best way to describe the Tank Cintrée by Cartier. Crafted from platinum, it has its Arabic numerals, hour indexes, and railroad track printed on the silver dial in a pale grey. What sounds boring is, in fact, a very subtle and stunning combination. On a grey strap, it is a true understatement but a statement it is. The perfect companion to go with that Kashmir sweater that you didn’t know how fast to get out of your closet when you saw the first snow fall from through your window. Grand Seiko celebrates the 20th anniversary of the caliber 9S with this stunning platinum watch of which only 20 will be made. Its movement is the successor of the legendary caliber 61GS V.F.A. that was launched in 1969. The letters V.F.A. stand for ‘Very Fine Adjusted,’ a reference for the impressive accuracy of this automatic watch. Its case is made from platinum it polished to perfection by Grand Seiko’s proprietary Zaratsu polishing technique.